When I first opened the box with the Tenba Cooper 13 DSLR inside, I knew I was in for something special. The bag itself came wrapped inside another bag! Very classy. Once I removed the Cooper and felt its fabric between my fingers, my first thought was this is going to be a great case to carry around. It’s a handsome slate grey on the outside, lined with a nylon interior. 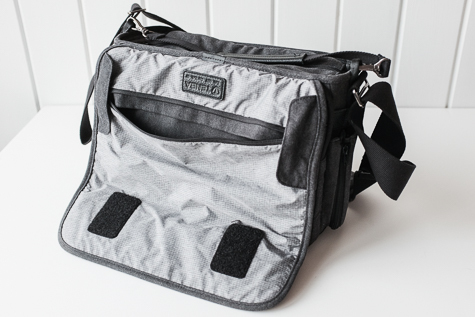 I’d consider the Cooper a messenger-style bag, and it also looks like a typical day-to-day bag. I’ll write first about the fabric because it was my initial tactile interaction with the Cooper. The exterior fabric is very soft and supple, feeling like it’s already broken in almost like stone-washed jeans. Tenba’s website calls this fabric Peach-wax cotton canvas with a 20% polyester reinforcement. It’s also coated with a 2x water-repellent PU coating so it’s essentially waterproof. The Cooper comes with an addition reversible weather wrap, but more on that later. 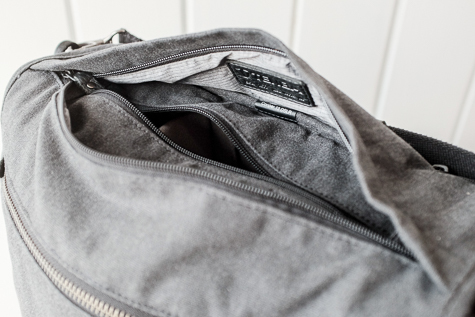 Overall, the Cooper is not as rigid as many other messenger-styled bags. Because of this, it generally conforms nicely to your body which helps prevent it from bouncing around too much when walking. This does make the Cooper feel a little floppy, which might be a turn-off for some. I prefer a floppy bag. There are leather accents all over the bag (sorry Vegans, the Cooper is not for you), from the removable handle and zipper grips to a handsomely appointed leather bottom. The leather tabs on the zippers make them easy to grab, even while wearing gloves. The leather bottom gives the Cooper a rugged and classy feel without being ostentatious. It serves the practical purpose of reinforcing the bottom while making it somewhat water resistant. I never worried that water would seep into the bottom of the bag when I set it down on a damp surface. The leather bottom is easily cleaned with a soft cloth. I counted at least seven pouches surrounding the exterior of the bag; there may be a few more I haven’t found yet. There’s a large back pocket which easily fits a 13” or smaller laptop. I fit a MacBook Pro 13” inside it, but it was a snug fit. The padding is rather thin on the outer wall of pouch so I will be careful when my laptop is in here. I put the MacBook with the screen side facing the interior of the bag so that it would get some extra protection. I wish the outer wall of this pocket had more robust padding. Maybe this is something that can be addressed in version 2. There are two small pouches on either side. 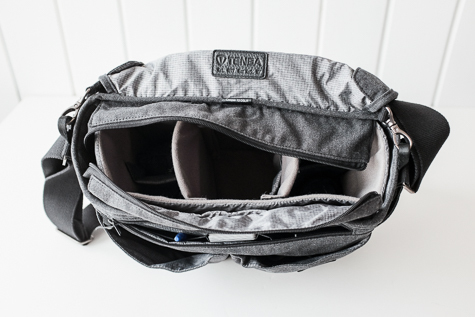 These side pouches have zippers and can open up and expand their width to easily to hold water bottles, small umbrellas or even small prime lenses. Since these pouches have no padding, I’m not sure I’d use them for a lens. The front of the Cooper has three more pouches: two small ones in the front and a large one behind them. The two front pouches can carry lots of small accessories, like batteries and memory cards. 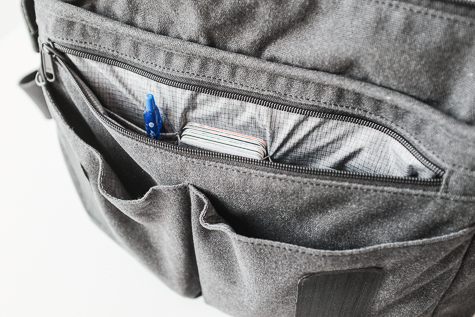 The larger pouch can easily fit a tablet has a slots for business cards, pens, and other small accessories. Finally, there is a zippered pouch on the front flap of the bag. In here, you can keep a phone or small tablet, or anything else you want to have quick access to. The interior of the Cooper has a removable, modular photo insert. It’s the same kind of insert you find in any other camera case, so nothing new here. It’s light colored so that you can easily see your dark equipment against it. This is a trend in camera bags that I’m deeply thankful for. Because it’s removable, you can arrange larger camera/lens configurations in the bag, albeit without the padded protection the insert offers. There are four different Cooper models, each slightly bigger than then next. This model, the DSLR 13, is built to hold a DSLR with several lenses, or a mirrorless camera with up to five lenses. On one field outing, the Cooper DSLR 13 easily carried my D7000 w/35mm f/1.4 (attached), an 80-200mm f/2.8, a 12-24mm f/4 and a 50mm f/1.8 with room to spare for my mirrorless Fuji X100T, extra batteries, an iPad, and a bunch of other small accessories. That’s a lot of gear! A larger Canon or Nikon DSLR will fit if it’s got a short prime or pancake lens attached, or you can reconfigure the insert so that a larger lens can be attached to the DSLR. The overall weight of the Tenba Cooper DSLR 13 is light, coming in at 2.8 lbs(1.3 kg), so it’s not going to add significantly to what you’re already carrying. 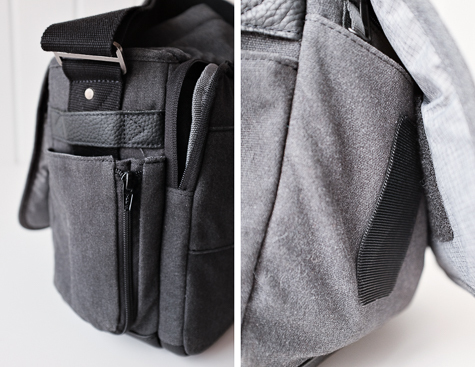 There’s a non-slip padded grip on the shoulder strap and it’s removable if you do not want it. The pad has small, sticky “grippy” spots to help adhere to your shoulder no matter material your clothing is made of. This is a great detail as I hate it when I have to constantly keep a bag from slipping off my shoulders. The front flap has some interesting features besides the extra built-in zippered pouch. First is a zipper which, when open, allows you to reach your equipment without having to open the flap. If you stow your camera with the hand grip facing towards the top, it’s very easy to reach your hand through the open zipper of the front flap and grab the camera without looking. Same for putting it back. I like bags that work with my muscle memory. The main body also has a zipper for extra security. I like this double-zipper configuration on both the flap and main body of the bag. I can close them both for security or leave the main compartment one open and the one on the flap closed, which I can then quickly open to access my camera. A real winning feature on the Cooper is the Velcro fastener on the cover. Just like any Velcro fastener, this one adheres the cover to the main body of the bag and keeps it secure. You can open the flap by pulling it with your hand and hear that typical ripping sound that Velcro is so well known for. What makes this Velcro special is if you pull the cover down then away from the body instead of just pulling up, the Velcro makes no noise, or very little noise, at all. This is a great benefit when you need to quietly get into the case without making that disturbing ripping noise. While I love this feature, I do wonder how long the Velcro will last. Most Velcro loses its grippy-ness after some time and I’m curious if the same will happen to this bag. Other competitors to the Cooper use magnetic fasteners to achieve the same results. I like Velcro better as it holds the flap more securely than magnets, but magnets tend to continue to work over time. Included with the Tenba Cooper DSLR 13 is an additional weather protection wrap that is reversible. You can use the weather wrap to protect it from rain or you can reverse it to its other silver-lined side to protect it from the heat of the sun. I was really happy to see that this weather wrap was included and didn’t need to be purchased separately. I used the wrap to add extra protection when I was walking in a driving rainstorm and it worked pretty well. The issues I had with this wrap were 1) it covers all the sides except the back of the bag and 2) the snaps that are used to secure the cover to the bag wouldn’t snap together if the bag was full. I’m not sure why Tenba used snaps here rather than Velcro that can connect to the bag no matter how thick it was. The Tenba Cooper DSLR 13 travels very well. There’s a slot on the back that can be used to slip over the trolley handle of any rolling luggage. It also fits perfectly under an airline seat. I carried the Cooper with me constantly for over a couple months so far, even bringing it with me on a vacation to Jamaica. It was perfect for this trip because I pared down the amount of gear I brought with me. 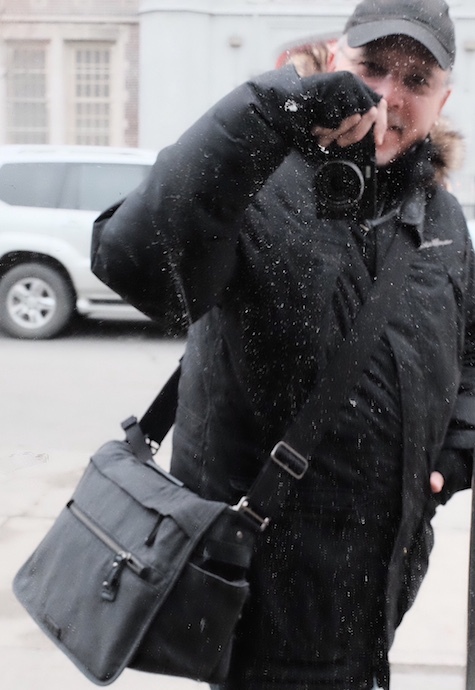 You can hear about my experiences on episode 36 of my Street Shots podcast. I love messenger-style bags because they double as a day-to-day carrying around tote and as a camera case. They fit my urban lifestyle very well and they don’t look like camera bags on the outside. Even full of gear, nothing about the outside of the Tenba Cooper DSLR 13 says “camera bag.” This is what I really like about it. Living in New York City, I don’t really want to advertise that I’ve got a bag full of expensive gear around my shoulder and Cooper blends in nicely with all the other day bags around me. I own a couple of Lowe Pro and Crumpler messenger cases, but I think I’ll be using the Tenba Cooper DSLR 13 more often. You’re not going to be carrying around a full panoply of gear in the Cooper, but that’s not what it was designed for. What you will carry around will be enough for a decent shoot day. The Tenba Cooper DSLR 13 retails for $250, which is a little out of my price range. If it were under $200, that would be a better price for me. 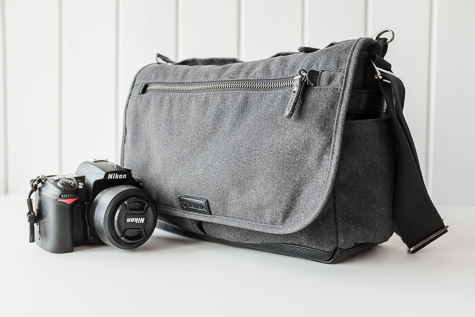 That being said, the Tenba Cooper DSLR 13 feels luxurious and, if price isn’t an issue, this versatile case is certainly worth purchasing if you’re looking into getting this style of bag. I’m giving it a solid 8 out of 10 MyMac review rating. Great job, Tenba.